Despite facing the prospect of criminal indictment, Benjamin Netanyahu has again successfully outmaneuvered his opponents, including three former generals, to cement his fourth consecutive term and fifth overall, which will likely make him Israel’s longest serving prime minister. 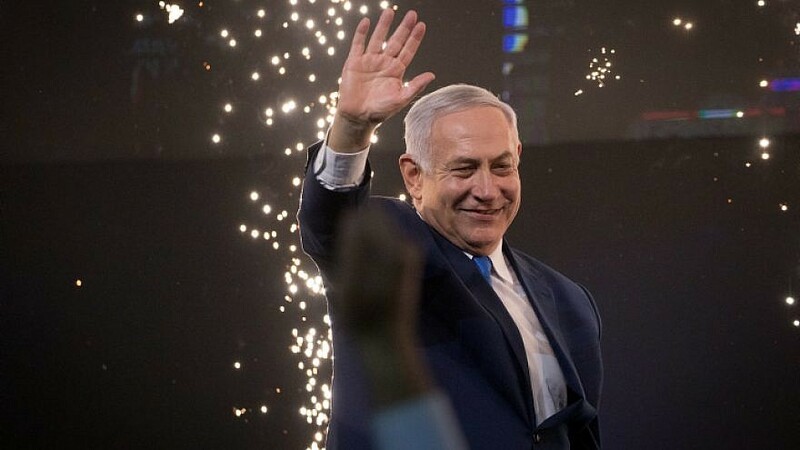 (April 10, 2019 / JNS) With nearly all the votes counted as of Wednesday morning, Benjamin Netanyahu will likely remain as prime minister, despite his Likud Party coming in a virtual tie with Blue and White Party leader Benny Gantz. With 95 percent of poll sites reporting, both Likud and Blue and White were in a virtual tie—35 seats a piece. However, by virtue of a strong showing amid allies on the right, such as religious parties like Shas and United Torah Judaism—and to a lesser extent United Right, Yisrael Beytenu and Kulanu—Netanyahu will likely have the necessary seats to easily form a right-wing coalition government. “I believe that God and history gave the Jewish people another opportunity to turn their country into a strong nation, and that’s what I’m working for,” he said. Despite facing the prospect of criminal indictment later this year, Netanyahu has yet again successfully outmaneuvered his opponents to cement his fourth consecutive term and fifth overall, which will likely make him Israel’s longest serving prime minister, eclipsing one of the country’s founding fathers, David Ben-Gurion. Additionally, his success in cultivating new ties with countries in Asia, Latin America and Africa, coupled with Israel’s phenomenal economic growth, were reasons to give him another term. Netanyahu also had cultivated warm ties with Russian President Vladimir Putin, despite their diverging interests in Syria. Last week, the Russian government helped Israel find the remains of missing Israel Defense Forces’ soldier Zachary Baumel, who was killed in 1982 Lebanon War. When the polls first closed at 10 p.m. local time, Likud members were cautious with initial exit poll results that put Gantz ahead. Nevertheless, key party members said they were confident that Netanyahu would remain Israel’s leader as more results rolled in. Just hours before Netanyahu’s speech, Gantz addressed his supporters in Tel Aviv as well. The former Chief of Staff of the Israeli Defense Forces also declared himself the victor, saying that he would be the next prime minister. “Yes, friends, I will be the prime minister of everyone and not just those who voted for me. No one from a party that is not ours should worry. We all need to think about how we can work together, how we can bring everyone into the discussion,” he said. However, now that it seems likely that President Reuven Rivlin will tap Netanyahu to form the next government, there might be a chance that Gantz could either form a unity government with Netanyahu or head into the opposition. New Knesset member for Blue and White Boaz Toporovsky said that “all options are on the table” when it comes to the next government, meaning that he did not rule out the possibility of a unity government with Likud. “We shouldn’t play this game right now. We should celebrate,” he said. Professor Abraham Diskin, a senior fellow at the Kohelet Policy Forum, said the key factors that would become clearer in the coming hours are the edge parties that may or may not get past the minimum threshold as the final votes are counted. The votes of IDF soldiers are also going to play an important role, he noted. “There is a very good chance that the right-wing bloc will have the majority,” Diskin told reporters at the Israel Project elections event in Tel Aviv. JNS reporters Josh Hasten and Yaakov Lappin contributed to this story. Just like his “favorite United States president,” both Bibi and Donald “the menace” go together because they are both “mishuginas” in a good sense. They both have plenty of their own faults, but when it comes to push or shove they have ability to keep their citizens safe.